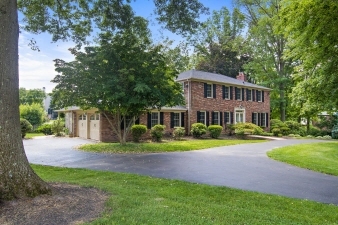 NEW roof, beautiful landscaping, and a circular driveway enhance this gracious home. One patio is covered, and is an inviting space for relaxing and dining while family and friends enjoy the sparkling pool. The 1 acre, level yard has ample grassy lawn for recreation and the pool area is separately fenced. Very private, yet convenient to major travel routes, shopping, restaurants, schools, hospitals, parks, and the Paoli Train Station, which offers express service to NYC.